Original Zion National Park cabins, restored into cabin style rooms and built into the East Zion Rental House now sit along the East Fork of the Virgin River. The rooms are equipped with air conditioning, heating, queen bed, tub and shower. Each room has a flat screen plasma TV with satellite and guests are welcome to use our seasonal outdoor pool and hot tub that sit on the Golf Course across the road from the cabins. Mount Carmel Junction is a resort area on the east side of Zion National Park where you can enjoy serene quiet, golf, swimming and resort amenities during your stay. These are not stand alone cabins, but rooms built into the East Zion Rental House. Enjoy a relaxed resort atmosphere and great prices! Low green fees and charming riverside cabin style rooms near Zion National Park for so little! Venture from your room for a swim in the seasonal heated pool, relax in the bubbly hot tub, play a round of golf or relax in the sports lounge with a drink. We take immense pride in making your stay all that you hope it will be. Out of the cities, we offer a vacation paradise nestled among the towering mountains of beautiful Southern Utah. 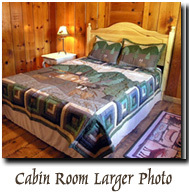 The East Zion Cabin style rooms are quaintly decorated, surrounding you with charm. 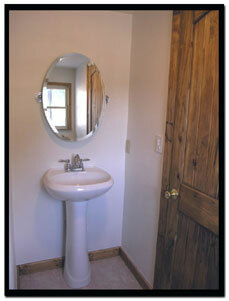 Cabin amenities include: outdoor seasonal swimming pool and hot tub located across the road on the Golf Course. Stay and play in the heart of southern Utah's National Parks and Monuments. Visit Zion National Park, Bryce Canyon National Park, North Rim of the Grand Canyon, Cedar Breaks National Monument, Grand Staircase-Escalante National Monument, Dixie Forests's Cedar Mountain Recreation area and Red Canyon. Nearby is also ATV Central - the Coral Pink Sand Dunes. Note: Although we often rent these rooms nightly, we do not take reservations for them since often these rooms rent along with the rental home. If you stop by early enough in the day you should be able to snag one of these. Nowhere in southern Utah can you be central to so many of natures finest attractions. Inside our Vacation guide, you will find itineraries directing you to the best that the southern Utah National Parks, National Monuments and National Forests have to offer. Browse through our guide and make your vacation the best it can be!